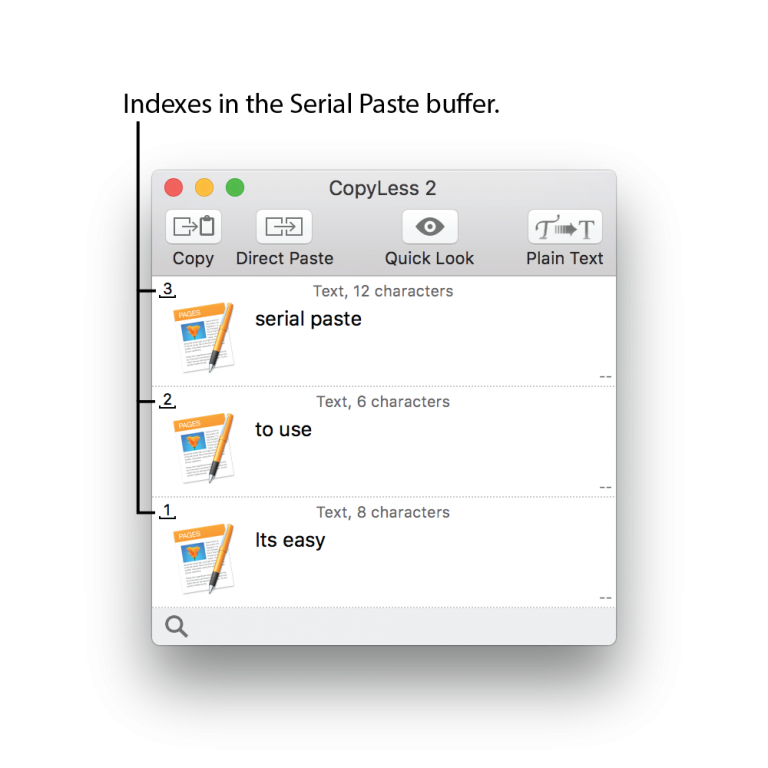 Serial Paste allows you to copy multiple elements and then paste them in the same order. Note: CopyLess Helper plugin is required for Serial Paste to work properly. Hint: To add existing elements to the Serial Paste buffer, just Option-Click them in the CopyLess window. ■ Start Serial Paste by choosing Serial Copy&Paste > Start Recording in a status bar menu. Alternatively, press ⌥⌘Y. ■ Now copy anything you want, the copied elements will be added automatically to the serial paste buffer. ■ Pause Serial Paste by choosing Serial Copy&Paste > Pause Recording. Alternatively, press ⌥⌘Y. ■ Copied elements won't be added to the serial paste buffer any more. ■ Resume recording any time by choosing Serial Copy&Paste > Resume Recording. ■ Recorded elements are replayed one by one in an order they have been added to the buffer. Choose Serial Copy&Paste > Replay Next to replay first element from the buffer. Alternatively, press ⌥⌘X.